Let’s start with the 0.3% reduction in headline CPI inflation, contrasted with the core (i.e. excluding food and energy) inflation rate remaining at 1.9%. This, first and foremost, suggests that only the food and energy parts were affected and thus there has been no effect from the real economy. The same holds for the RPI, which is the index many goods in the UK economy are linked to. To explain the decline all we have to employ is the exchange rate and the price of Oil. In particular, the GBPUSD exchange rate averaged at 1.258 in January 2019, 9% lower than the 1.382 rate that persisted a year ago, attributed to the interest rate differential between the two countries. In contrast, the price of Oil stood at $57.5 in January 2019 and $66.8 in January 2018, or a 13.7% decrease. Overall, a barrel of Oil would cost GBP 45.71 in January 2019, compared to GBP 48.33 in the same month last year. Thus, Oil costs would decrease by 5%, which, considering Oil’s weight in the RPI, would result in an overall decrease in prices by about 0.19% – which is almost exactly the rate at which the RPI declined since last year. Overall, there appears to have been no improvement stemming from the UK itself as the observed changes are linked to the price of Oil and the exchange rate. At the moment, markets appear to have understood this, as prices moved back below the 1.2919 Resistance level, currently trading around the 1.29 level. 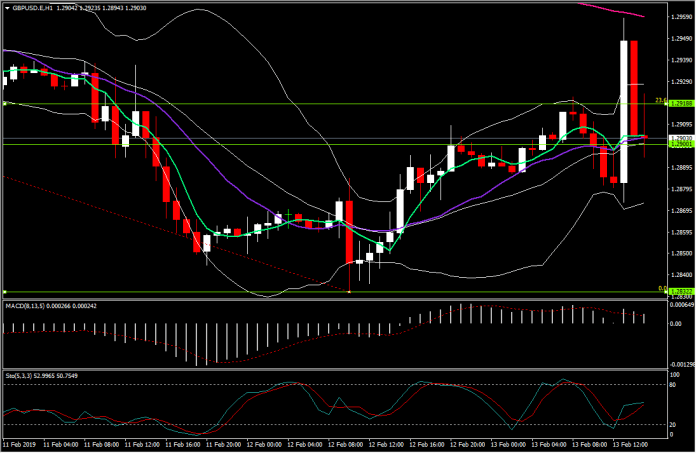 If that Support level is broken then the next move should be towards the 1.2832 level (Fib. 0.0%).